Busch’s spoof echoes Mel Brooks’ movies with its amalgam of nun memes, two fun songs, running gags, and off-color humor. The play runs the gambit from The Flying Nun and The Sound of Music to Doubt and Agnes of God. The Mother Superior, played by Velma Jean Merman, has a convent that’s falling apart, a postulate who sees visions, an ex who wants to exploit the postulate for a film, a friend who’s falling apart, a Jewish Atheist neighbor, and a spy for good measure. Velma’s simple presence evokes laughter from the audience. The Mother Superior comes riding in on a bicycle ready to sing and dance and yet try to keep the walls of the convent from collapsing (as bricks fly from the wings onto the stage). Although any of the actors could have been crushed by Merman’s exuberance, they all match Merman in energy, comic timing, and style. Sasha Castroverde portrays the bubbly, yet disturbed postulate who sees saints’ faces in the strangest places and exhibits the stigmata–kind of. She does both the younger and older versions of Julie Andrews by being both darling and saucy. Although young, she holds her own and will be a palpable force to be reckoned with in the future. Paula Plum acts as Mother Superior’s partner-in-crime, Sister Acacius. Sister Acacius and the Mother Superior have known each other since before they were good. Plum mirrors Merman’s vivacity and even exceeds it when she goes crazy and gets possessed-ish. If they had the time, Merman and Plum could belt out “Bosom Buddies” from Mame without missing a beat. The songs in the play were catchy and made me want to go out and buy the script afterwards to know the lyrics other than “la, la, la”. Furthermore, the play never takes itself too seriously and is self-referential in places; this allows the audience to play along without being overwhelmed when the play goes past the point of sanity. Christina Todesco provides another level of slapstick as the set interacts with the characters. The pacing drags in a few places due to some jokes that do not work or are too tired (not unlike Mel Brooks’ movies). But on the whole, I barely realized that there was no intermission. I would say The Divine Sister is like Nunsense on crack, but since a nun in that show did cocaine, I need to find a better comparison. Take the beach movies and nun movies of the 50’s and 60’s, remove the repressed innuendo and kick it up to Seth McFarlane-level, add puns, hilarious references, quotable lines, and some bodily humor and you will almost approach what this show is like. 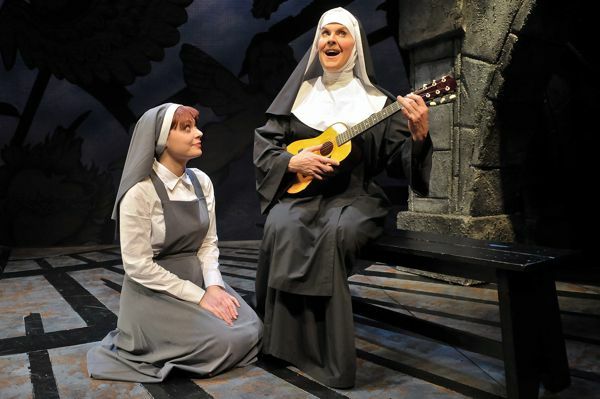 If you like Mel Brooks or Monty Python, you will like The Divine Sister. This entry was posted in Comedy and tagged 2011, 50's, 60's, Boston, Charles Busch, Christina Todesco, Christopher Michael Brophy, Comedy, Ellen Colton, Julie Andrews, Kathy St George, MA, Mel Brooks, miracles, mystery, November, nuns, October, Paula Plum, Sasha Castroverde, Seth MacFarlane, singing, Speakeasy Stage Company, spoof, The DaVinci Code, The Divine Sister, the flying nun, the singing nun, the sound of music, Varla Jean Merman, visions by beccackidwell. Bookmark the permalink.